At one point or another, you have probably wondered why some cars have a big wing on the back. Is it for coolness, or is there a practical purpose? Who first decided to take advantage of downforce? The wings on an airplane are designed to take air flowing across them and produce a vertical force that lifts them off the ground. Since the airplane is hopefully attached to the wings, the plane takes off. That's of course unless a passenger suddenly becomes ill and forces the plane to return to the terminal, and everyone on the plane waits while the passenger is escorted off and the baggage people find that passenger's baggage, and all this takes so much time that the pilot misses the window of time on the runway and you are forced to wait an hour and you miss your connecting flight in Reno and you miss Thanksgiving. On a race car, the same principle is applied, but upside down. 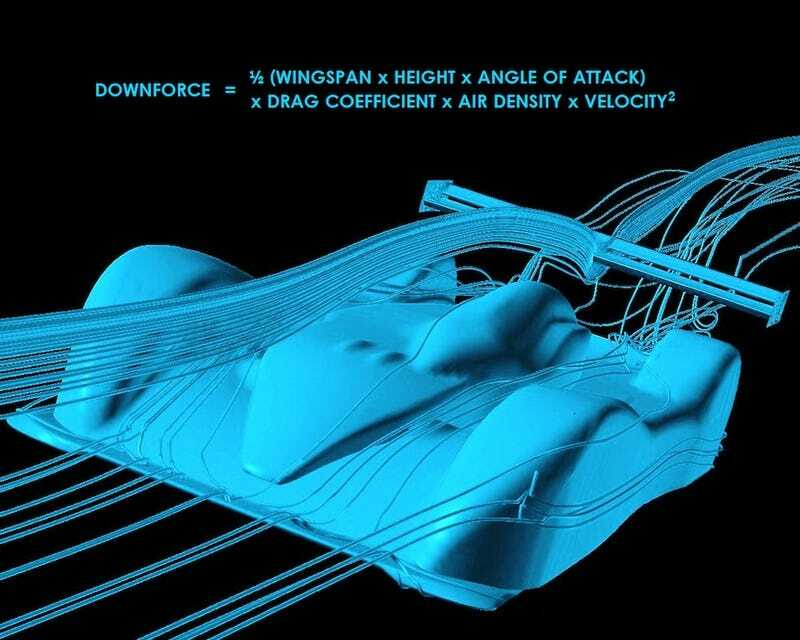 As the car moves, air speeds over the wing, and a downward force is produced. This downforce helps keep the car glued to the ground. In a straight line, that's great. As the engine spins the wheels, the wheels are less likely to slip. But around a corner it's even better. That downforce increases the friction force, and that means you can go faster around corners without spinning out and crashing into an orphanage. Downforce has an effect similar to putting a load of bricks in the car, but without forcing the engine to have to work hard enough to get all those bricks moving. In a way, downforce increases the weight of the car without increasing the mass. How's that for some witchcraft? All of that is uplifting, but who first decided putting big wings on an airplane would make it go faster? Who looked at an airplane and thought, "Hmm, yes, that would look good on my car"? took off - at least not until the 60s. McLaren briefly experimented with wings on their F1 cars in the early 1960s, but the idea was dropped. It was the Lotus 49 that finally gave downforce some lift. In 1967, Lotus that made its Formula One debut of the Lotus 49, the first F1 car to use aerofoil wings. The original wing design had the rear wing miles above the car, and driver Jim Clark won in its debut race. The Lotus 49 went on to win 12 Grand Prix races. After many near-fatal accidents involving the failure of the wing mounts, sky-high wings were banned, and F1 cars were required to have their wings mounted on the body. Regardless, Formula One was changed forever. Since the debut of the wing in that late 60s, automotive wings and aerodynamic downforce have been a staple of successful F1 design. "Sick. I'm going to put a wing on my ride, yo!" First, your ride is front-wheel drive. I can tell. It's also made by a company that rhymes with "Rwanda", and it's not Zonda. Your Civic and most other hatches are front-wheel drive. A big wing on the back of a rear-wheel-drive car helps keep the rear tires glued to the road, and this makes sure the back wheels won't slip while the engine spins those wheels. However, in your front-wheel drive car, a wing will tend to lift the front of the car off the ground, and that lifts the driving wheels off the ground. That means you could lose control, and you and your homeslices will end up in a ditch. Furthermore, aerodynamic downforce only really comes into effect at higher speeds. Downforce increases a lot as velocity increases, but doesn't really exist at lower speeds. Unless you frequently get your Civic up to higher-than-legal speeds, that wing is only going to increase drag, and that will slow you down. You're better off paying your most obese friend to ride with you. Perhaps you want a spoiler. Unlike a wing, a spoiler doesn't create downforce, but instead plays with the air to reduce drag and increase efficiency. However, most spoilers on cars are decorations and decorations only. Some even have a negative impact on efficiency. Unless you've done all of the math, you're better off leaving the spoiler on the shelf. Since the 1960s, wings help cars stick to the road and race around corners at high speeds. While they're not entirely practical on road-going vehicles, wings have had and will have a major impact in the world of automotive racing.